4k touch display for an immersive experience The new Razer Blade 15” gaming laptop takes visual pleasure further with a stunning 4K UHD, 3840 x 2160 touchscreen display, providing immersive edge-to-edge gaming in an incredibly thin form factor with 4.9 mm thin bezels. Equipped with a Hex-Core 8th Gen Intel® Core™ i7 processor and an NVIDIA® GeForce RTX 2070 graphics with Max-Q Design for an impressive gaming performance. With dual-channel memory and 512GB NVMe SSD both provide a smooth experience. The per-key backlit keyboard features Razer Chroma software that allows you to customize your keyboard keys individually with RGB lighting. Openly connect up to three external displays for an extensive workstation through Thunderbolt™ 3, Mini DisplayPort, and HDMI. EXTREME PERFORMANCE TO CONQUER ANY TASK The new 15” Razer Blade is powered by an incredible 8th Gen Intel® Core™ i7 six core processor and the new NVIDIA® GeForce RTX 2070 graphics with innovative Max-Q design. Get full control while simultaneously playing and streaming, or exhausting the latest creative apps to edit videos. 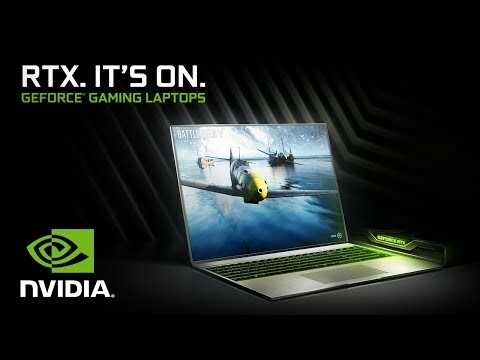 a gaming performance like never before Equipped with the new game-changing NVIDIA® GeForce RTX 2070 GPU with Max-Q Design, unleash gaming dominance with the incredibly thin Razer Blade gaming laptop. Experience real-time ray tracing, artificial intelligence, and programmable shading with the Turing based outstanding GeForce RTX graphics. The latest generation of graphics provides even better performance and power efficiency of previous-gen GPUs. Get more out of your viewing experience The new Razer Blade laptop allows you to enjoy immersion like never before with a stunning 4K, 3840 x 2160 touch display, offering 100% Adobe RGB support, with a wide colour gamut for superior vibrancy. Despite being as thin as 0.70”, Razer Blade’s 15.6" screen features edge-to-edge gaming consuming nearly 85% of the visible display area, flanked by class-leading 4.9 mm thin bezels. More Memory. More Storage. The Razer Blade 15 comes equipped with 16GB Dual-channel DDR4 RAM, this gaming laptop is ready to do more and store more. The 4K UHD Razer Blade can be customized to meet a range of user needs as it features expandable memory to 64GB for amazingly smooth multitasking, and includes a 512GB PCIe 3.0 x4 NVMe M.2 SSD for super-fast data access, utilizing a pure SSD solution in a thinner chassis which can also be upgraded. Unleash the true potential of your keyboard Light up your world with Razer Chroma™. Featuring vibrant lighting with full per-key customization, the individually backlit keys on the new Razer Blade 15 offers endless possibilities for customization. Use the Razer Synapse 3 software to easily choose your custom lighting effects, manage profiles, adjust fans, and even step up the graphics performance in Gaming Mode. The precise glass touchpad gives users expanded navigation and is clickable with Microsoft Precision Touchpad support. Ultra Fast. Ultra Small. Ultra Powerful. You’d never imagine that all this power can be packed into a 0.70" ultra-thin CNC aluminium unibody chassis, but Razer have done just that. The result is a machine that is both refined and relentless. The new Razer Blade 15 utilizes an innovative custom cooling which is designed to dissipate heat and maintain high performance levels wherever you are. thermal materials to proficiently and quietly dissipate heat 1 Custom 44 blade fans for high air flow and low noise. 2 Graphite-based, server-grade thermal materials deliver precise control of heat and reliability. 3 Nanoparticle thermal blockers to reduce hot spots. 4 Integrated heat exchangers with 68 fins just 0.1 mm thin each for maximum heat dissipation. ultra-fast Thunderbolt™ 3 connectivity Connect a Razer Core X via Thunderbolt™ 3 and get more frames per second in games with a higher power desktop graphics card. You can combine the power of the built-in NVIDIA® GeForce® 10 Series graphics with a second GPU to decrease render times in supported creative apps.